Climate-control and non-climate control units are available. Join the best conventional self-storage facility serving Lansing and Leavenworth. To reserve a unit online at AAA Mini Warehouse, simply fill out our custom contact form and a member of our staff will contact you with available options. Or, you may call us at 913-727-6470. 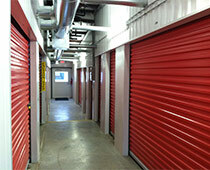 Self Storage in Lansing, KS Access To Your Storage Unit 24/7! AAA Mini Warehouse has been in Lansing, Kansas for 27 years and is proud to serve the Lansing, Leavenworth, Fort Leavenworth, Bonner Springs, and Basehor areas. In 2007 we added 207 climate controlled units and more traditional self storage units bringing our unit count to 598 units. We offer inside and non-covered parking spaces and P.O. Boxes. Our large inventory of moving supplies and locks make our business a one stop shopping convenience to meet your moving needs. We are members of the national Self Storage Association as well as the Kansas Self Storage Owners Association. We welcome the opportunity to show you our property and discuss how we can meet your storage needs. We look forward to seeing you soon. "My son and daughter needed to store their furniture during the summer away from college. Since the college gets most of my money, I needed an affordable place within my tight budget. AAA Mini Warehouse is the perfect place." "We sold our old house before our new house was ready. We needed a short term lease to store a whole lot of furniture. The month to month lease was great for our unique situation." "My father recently passed away and I just couldn't part with his belongings. I didn't know how long it would take for me to go through all his stuff so I needed a climate controlled unit to store all that was left of him. Not only did a climate control unit protect the furniture but it also provided me some peace of mind knowing those treasured items were as safe in the unit as they were in my own home." "Having access 24 hours a day, 7 days a week allows me access to my belongings when it is most convenient for me." "The employees helped me decide what size unit I needed based on the stuff I had to store. They offered me great tips on how to pack the boxes as well as how to stack the stuff in the unit. There was no way I could have gotten it all in that small of a space without their help." "The property always looks pretty and well maintained from the street. The units are clean and secure. I feel safe when I am there." Do you have a testimonial you would like to share? Please use our contact us section to email us about your experience with us. Please contact us via our contact us form, or call us directly to speak to a member of our friendly staff. Are you looking for a storage unit in the Lansing, Leavenworth, Basehor or Bonner Springs area? Let us help you find the climate controlled, non-climate controlled, parking space, or P.O. Box that best fits your needs.